Convert raw iTunes product URLs on your WordPress site into globalized and affiliated links! What is the iTunes Link Engine? This is a programmatic method for building links. Learn about the the differences between manual and programmatic links here. Install the iTunes Link Engine. Activate the plugin through the Plugins menu in your WordPress Dashboard. Once activated, your links will automatically be localized from then on! 1. If you don’t have an account already, create a Geniuslink Account. 2. After signing in, navigate to the Tools page and generate a new API Key and Secret. 3. Next, log into your Wordpress site, and navigate to the Plugins tab. 4. From here, find the iTunes Link Engine plugin, and click on Settings. (Note: be sure that the plugin is activated on your site first). 5. Once here, copy and paste the API Key and Secret into the iLE. Step two should light up in blue and you will get a Connected! message. 6. From here, select the Group where you would like the clicks to be recorded. 7. If you're using a Custom Domain, you can select which domain you would like to use with the iLE. (Note: You will need to set up your custom domain with the Geniuslink Service prior to completing this step). 8. Be sure to hit Save Changes and you are all done! 9. Your click data will now be flowing into your Geniuslink account! 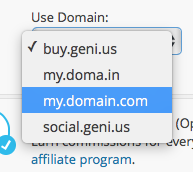 If you have already added your Affiliate parameters to your Geniuslink account, you’re good to go! If you haven’t already, sign up for the Partnerize iTunes affiliate program (instructions on how to sign up can be found here). 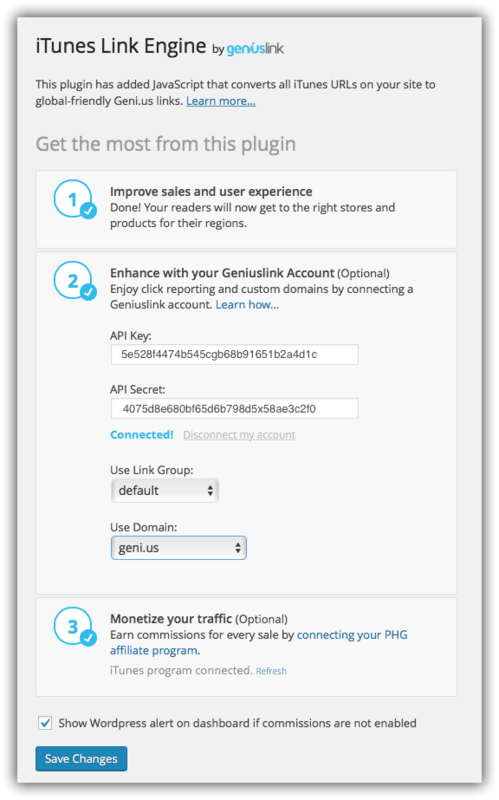 Once approved, jump into your Geniuslink dashboard and navigate to the Affiliate page. Then, click the Connect an affiliate program button and paste in your iTunes affiliate token. Once saved into the dashboard your links will automatically be affiliated with your iTunes parameter when they are clicked. Click here to learn more and download the iTunes Link Engine Plugin.